Writing about why I love YA is like answering one of those “Why should I hire you?” or “Tell me about yourself” type of job interview questions. I've never been very good at those. You know that you need to go into specifics, but you’re drawing a total blank. In my heart, I know that I love Young Adult books, but I guess that I’ve never actually sat down to think about why I do. I sort of feel like I’m back in school, staring at an open-ended writing prompt on a test; I have a lot to say on the topic, but I don’t know where to begin. 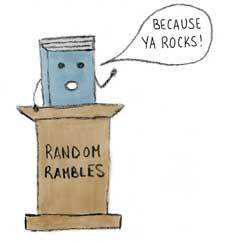 So please bear with me, because I think that I’ll really be putting the “Ramble” in “Random Rambles” today. If you would have told me that, at 35, I would be reading YA books, I would have laughed. Hard. I don’t remember there being as wide a selection of Young Adult titles as there are now way back when I was in high school. And I definitely don’t recall seeing adults borrowing them from the library or reading them in doctors’ offices. Once I had outgrown reading Sweet Valley Twins (I tried the Sweet Valley High books but felt like I’d move beyond those, too), I jumped straight into adult fiction and pretty much stayed put there. It was finally giving in and reading a little book called Twilight that ignited a YA reading frenzy. I couldn’t read enough books about star-crossed teens and their paranormal adventures. I think that a huge reason why I fell so hard for these kinds of books was because I didn’t have the chance to read them when I was a teen. I love the idea that supernatural beings could be walking among us. Apparently, I’m also a complete sap for tales of falling in love for the first time. After getting my hands on as many YA paranormal romances as I could, I started branching out into other genres. In the back of my mind, I kept waiting to encounter a YA book that I just wouldn’t get because I’m not part of the target demographic, but that has only happened maybe once or twice. The overwhelming majority of young adult books that I’ve read made me completely forget that I was reading a young adult book. There’s nothing watered down about YA; its characters often face situations as difficult and as complex as those of any adult characters. I’ve been moved to tears by Melina Marchetta’s Jellicoe Road, Gayle Forman’s If I Stay and Where She Went, and, of course, John Green’s The Fault in Our Stars. I’ve been sent into fits of laughter by Stephanie Perkins’s Anna and the French Kiss and Lola and the Boy Next Door and Rachel Cohn and David Levithan’s Dash & Lily’s Book of Dares. I’ve been utterly blown away by the beautiful prose of Melina Marchetta’s Finnikin of the Rock and Maggie Stiefvater’s The Raven Boys. It pains me to think that I would have missed out on all of these amazing books and many, many more if back in 2008, I’d decided that I was too old to read Twilight. For me, the very best thing about reading YA as an adult is getting to talk about these books with my teenage cousins. Besides not having the incredible selection of books that they enjoy today when I was their age, I also didn’t have any family or friends who shared my love of reading. Ally (co-blogger here), Melissa (guest blogger here), and I have spent many hours debating whom Katniss should have ended up with and whether Tessa will choose Will or Jem. Sometimes we manage to rope in their younger brother, Denis (who also occasionally posts here), on the conversation, as long as the book under discussion isn’t too girlish. I love having this connection with them, and I really believe that even when we’re all adults, we’ll still be reading YA together. I’m very proud to be an adult who reads YA. It rekindled the love of reading that I had as a kid. Reading books again eventually led to reviewing books. I haven’t written this much since I was in college, and I realized how much I missed doing yet another thing that I had once loved so much. I owe a lot to YA, and I’m always happy to spread the word about how awesome it is whenever I can to young adults and not-so-young adults alike. What a brilliant post! I love YA - it is awesome! I never would have gotten back to reading if it hadn't been for YA. It really has changed my life! Thank you! It seemed like such an easy topic to write about, but I had a really hard time putting my thoughts down into words.